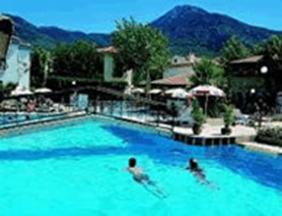 · Great amenities including 2 restaurants, a Turkish bath / sauna, snack bars and regular daytime and evening entertainment. Located towards the back of the bustling resort of Hisaronu, in a quiet location just a 5 minute walk from the heart of the restaurants and bars is Asena Village. A popular choice for families, it is a large hotel home to 118 rooms, a Turkish Bath, Sauna, 2 restaurants, snack, pool and terrace garden bar, mini market, and large pool with separate childrens area. All the rooms are air conditioned with mini bar, telephone, hairdryer, double or twin beds and a balcony or terrace. There are 18 family suites and 6 self contained, one bedroomed apartments.